We have a pasta dish at least once a week. It's quick, tasty and with the right ingredients pretty reasonable. It also just happens to be Miss JibberJabber's favourite meal. 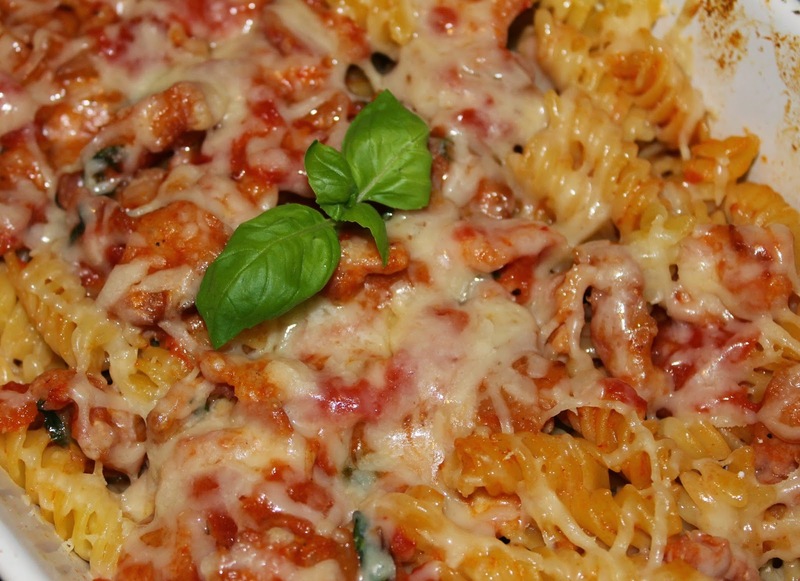 Usually our pasta dishes consist of a cheese or tomato base but this recipe combines the two. The bacon comes into it as I went shopping at 10.30 in the morning one day and they were already doing second reductions. The packs of cooking off the butcher's counter had been reduced to 35p so I bought all four packs to put in my freezer. I have made this dish many times without the bacon so it is quite feasible to leave it out. 2. In a large frying start to fry the bacon until it is coloured. 3. Meanwhile in a large saucepan cook the pasta according to the packet instructions. 4. Once the bacon has browned add the tomatoes and break them down in the pan. 5. Add the mozzarella, half the grated cheese, basil and black pepper. Bring to the boil then remove from the heat. 6. Once the pasta has cooked drain it and put in the oven-proof dish. 7. Pour over the sauce and then sprinkle on the remaining grated cheese. 8. Cook for 10 minutes until the cheese starts to bubble. Linking with Emily at A Mummy Too for #RecipeoftheWeek and Lucy at Supergolden Bakes for #CookBlogShare. A fab tea time basic :) I love cheese..... wish my kids could eat it! I don't know what we would eat if we couldn't have cheese! Just my kind of meal! yum! We are big fans of pasta in this family too. I'm veggie but I love Quorn which would work really well in this reicpe. Yum! Perfect for cold winter's nights! Yes, you could add Quorn after the tomatoes and cook it through before adding the mozzarella and basil. I love pasta bakes! It's almost every week in my meal plan, so easy to make, no need for fancy ingredients too! It's a meal I make all the time. We do something quite similar here too. I love the simplicity of meals like this. I know my boys would adore this. They both love pasta any which way ot comes! This is exactly the sort of thing I would cook when I haven't got a lot of time. It looks delicious so I'm bookmarking it. Ooh, I could so eat this right now! Perfect for a family meal. Now this looks and sounds lovely!